That “special “sound … the bringer of news, good and bad … hardly recognisable in its present form these days … Rhumbelow Theatre returns you to the sounds and music coming from that long-suffering, incredible device …The Radio … in The Gentry – the Radio Show. Band line-up includes well-known musicians Wade Wight on piano and vocals, Gavin Hughes on drums and percussion, John Skuy on bass guitar and vocals and … introducing for the first time at the Rhumbelow, James Carlsen on guitars and vocals. 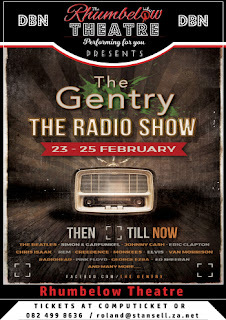 The Gentry - The Radio Show has performances at St Cyprians Church Hall on February 23 and 24 at 20h00 and on February 25 at 14h00 and 18h30. The venue opens 90 minutes before show for picnic dinner. All Rhumbelow Durban shows have been temporarily moved to St Cyprians Church Hall, 603 Umbilo Road, Glenwood, Durban.